If you truly want to experience history and the whole funky New Orleans vibe, you'd be hard pressed to do better that this. The house has been in films, HBO's Treme, American Horror Story - Coven, Dermaphoria, has been photographed by world renown photographers for Rolling Stone and Details magazine and featured in a new book on Creole New Orleans by photographer Richard Sexton. The house built during New Orleans' golden age and is an architectural gem that features 14 foot ceilings, original plaster moldings, mantles, and frescoes, solid mahogany staircase, 2 cast iron balconies, and marbelized base boards. This historic house was built for Free Woman of Color, Louise Vitry and her French consort, Archille Courcelle and their 4 children from land bought from the Baroness de Pontalba. The house was subject of an 1858 Louisiana Supreme Court Decision in which Louise Vitry was allowed to keep her house and her 7 slaves prior to Civil War. Original complex extended to the next block (St. Philip Street) with green house, wine cellar, out door kitchen, stables, 4 water cisterns, and servants wing. All that, sadly, is gone with the wind. House is located blocks from the French Quarter, is 1 mile exactly from City Park and Fairgrounds for Jazz and Voodoo Fest. 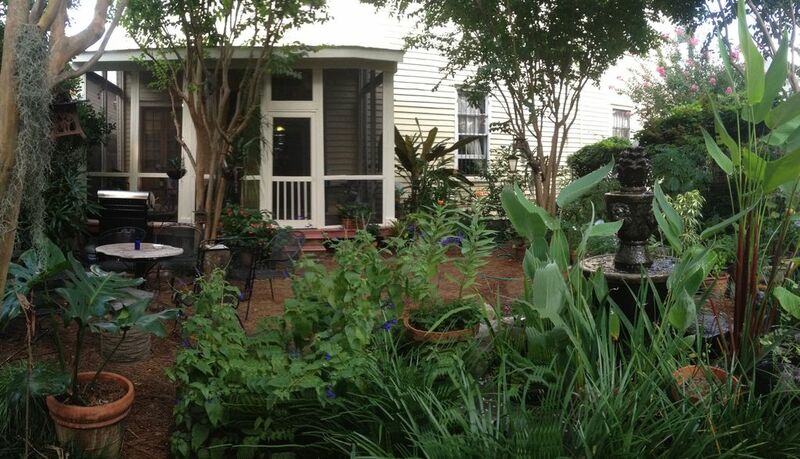 Balcony and Patio Garden: Immerse yourself in New Orleans history and culture. Close enough to the Mississippi to hear the horns on the river boats or view the fireworks on the river from the side and front balconies. Now with a generous screened in porch overlooking the tropical garden. House has an incredible night time view of skyline and spire of St. Louis Cathedral. If you're looking to experience 'True New Orleans', you'd be hard pressed to better than this old mansion situated in the Historic Treme. You will stay mostly in the 2nd floor of the house where all the amenities are set for your comfort. A large master bedroom queen size bed, a 2nd bedroom queen size bed and a large guest bedroom-living room (the blue room in the photos). Spacious kitchen-dining room and two full bathrooms upstairs plus a 3rd bedroom queen size bed and a 3rd full bathroom downstairs. The sitting room connects to both side and front balconies that catches the breeze with incredible views of New Orleans downtown skyline and the back of the Armstrong Park Sign, especially at night. Perfect for evening cocktails. Guest living room suite includes a queen size sleeper sofa bed and and a couple air-mattress. Downstairs, make yourself at home with a large screened porch and a private, large, lush tropical garden with spanish moss draped trees, tinkling fish filled fountains, plenty of chairs, outdoor speakers with radio or iPod connector, a barbecue grill, and night lighting. You have your own, private flower filled New Orleans oasis. It is a great place to un-wind and slow down to 'New Orleans time'. You'll probably find yourself spending most of your time out in the patio. Not recommended for children. Downstairs parlor not for use at the moment 'til end of Jan/14 due to a filming. CHECK IN time after 1:00 pm. CHECK OUT time before 1:00 P.M. CST. Will be happy to answer enquiries via email as to availability for full house. No burning candles. No professional filming or photography without owner's authorization. Please do not re-arrange furniture except portable chairs for balconies and gardens or accommodations. This is a private residence, please use all things in the house with care and respect all personal items. Do not wear Mardi Gras masks and costumes unless it has your name written on it. Might be the event we need to go in the house during the day usually with a previous text or call. This is a non refundable contract, please take your time to read and share with the other guests all the information, reviews, do your own research and ask any questions you might have. Usually after a booking we have to turn back many other people asking for the same dates. The number of guests staying in the house should not exceed the party booked for. Could be subject to a termination of the lease and/or be a charge of $50/day per extra guest and a penalty of part or all of the deposit. Absolutely no subletting. Please return all keys. Lost key $25. Lessee agrees to relieve Lessor and hold Lessor harmless from any and all liability in connection with the property. Information written in the website about the property and amenities are part of this rental agreement. Enjoy the house, the neighbor and the city with responsibility. Will - prefer initial contact via email. About Will - prefer initial contact via email. Committed to sharing the beauty and culture of New Orleans with those who are open to experience it. A step back in time that gives a feeling that you are no where else in the world but New Orleans. A rare and authentic insight into Creole lifestyle in the 19th Century. View more about Will - prefer initial contact via email. Both Guest Bathrooms are brand new. We are about a 15-20 minute walk from Downtown. We are .7 miles from downtown. Window Units + ceiling fans in bedrooms, living and dining rooms. Gas Space heaters. Units have to be turned off while leaving the house. Large tropical patio with fountain. Almost always something in bloom. There is a classic New Orleans Cast Iron Balcony across the front of the house as well as on the side of the house. No burning candles, No professional filming or photography without owner's authorization, please do not re-arrange furniture except portable chairs for balconies and gardens or accommodations. This is a private residence, please use all things in the house with care and respect all personal items. Do not wear Mardi Gras masks and costumes unless it has your name written on it. Might be the event we need to go in the house during the day usually with a previous text or call. Guests in the house should be the same or less than the party booked for. This is a non refundable contract, please take your time to read and share with the other guests all the information, reviews, do your own research and ask any questions you might have. Usually after a booking we have to turn back many other people asking for the same dates. My brothers and I brought our parents to New Orleans for our mother's birthday, and we are delighted we had the opportunity to stay in this beautiful, historic home! It is exactly as advertised, "elegantly decayed," with gorgeous old features and interesting objects everywhere you look. You can spend hours inside the home, discovering the history of New Orleans as you explore each room, and hours more in the garden admiring the foliage and eclectic decor that Will has collected here. We had a few rainy days during our trip, so the covered patio became a refuge for us to still feel like we were 'in it' and connecting with each other. The neighborhood is lively and safe — we felt comfortable walking around the neighborhood, and back-and-forth to the French Quarter, all hours of the day and night. Will was an incredibly gracious host, reaching out occasionally to make sure we were comfortable and providing thoughtful local recommendations based on things we were interested in seeing and doing. We had mentioned that we hoped to experience a jazz funeral procession, and Will came running over to the house (he lives a few doors down) to make sure we didn't miss it as one rolled right past us! That was a great experience, and we so appreciated Will making sure we didn't miss it. We would definitely recommend this home to friends and family, and would love to stay again on a future visit to New Orleans! The house is absolutely lovely. Clearly well maintained, but you feel like you are staying in a different time. The history of the house is captivating. Will was friendly and accommodating, and there were plenty of clean towels for all 6 of us. You can definitely walk from Bourbon Street, or it's a quick can ride. This is a great stay! I was excited to stay here based on the description but once I got to the house, I was in awe of how gorgeous the house is. The house was comfortable and has every amenity you need. The awesome sound of a cardinal in the courtyard every morning and the occasional visit by a friendly cat from time to time made me feel like home. The host was nice enough to give me a brief history of the home which was awesome sharing with anyone I spoke with the whole time I was in NOLA. He also has great suggestions for where to eat and go. The only bad thing that I can say about my stay at this amazing home is that I didn't stay long enough. I'm a big walker and it took me about 12 minutes to walk to the quarter however an Uber ride was minutes away. There are great restaurants near by in this great neighborhood. I was used to staying at one place in the quarter for the last 10 years and this was a last minute change. Needless to say, I will always try to stay here before staying anywhere else from now on. Thank you for everything Will and I hope to see you again. Awwww! Thank you so much. We’re glad you had a good time! We enjoyed our stay at this beautiful house so much! We always love to stay where the people live and we were able to see the entire city from our central location. Thank you so much and I'm glad you had a good stay. Always welcome to return. Hi, we pretty much like some local restaurants and spots, not much in the French Quarter but it's a lot of good restaurants there if you in the area. One we like is Eat New Orleans, not expensive and is BYOB with no corkage fee for the 1st bottle, 2nd is $15. Nearby to the house is a new spot called Gabrielle; you might need a reservation. In the Bywater look for Bacchanal, good food and live music. For good Gumbo and Po-boys Liuzzas by the Track. Frenchman Street has good bars with live jazz music. Lot of museums and places to go depends on interests, the riverboats are fun; also the walk along City Park where is the NOMA Museum of art. Always a festival somewhere with great music, food and fun. Min stay is 3 nights. 2 Nights stays upon request. Check ins / check outs flexibles unless we have same day bookings.